Scattered along Italy’s west coast in the Tyrrhenian Sea lie the stunning Pontine Islands, consisting of two groups: Ponza, Gavi, Palmarola and Zannone in the northeast and Ventotene and Santo Stefano in the southwest. There’s something for everyone here, whether you’re a keen swimmer, food lover, sailor or history buff. You’ll find sparkly coves, sandy beaches, charming trattorias, fascinating Roman ruins and untouched areas waiting to be explored. The most visited island, Ponza offers magnificent coastal walks and tiny harbours dotted along the shoreline. Inland, there are lively cafes and traditional restaurants serving locally caught seafood. Ponza also has some superb beaches. The idyllic Lucia Rosa boasts romantic, colourful sunsets, while Feola Cove’s shallow pools are the perfect place to relax all afternoon. Palmarola is widely regarded as one of the world’s most beautiful islands. The steep, craggy coastline opens up into an enormous cove with a pool of crystalline water and picturesque caves. There is even a superb restaurant on the beach serving up fresh pasta. There's also plenty to be explored wherever you go. The peaceful island of Ventotene features the remains of the Roman Villia Giulia where Emperor Augustus exiled his daughter in 2 BC for treason. There are more historical remains on Zannone, an untouched island and part of the Circeo National Park, featuring the remnants of a Cistercian monastery. The Pontine’s underwater landscape is a dream for divers and snorkelers. On a dive, you’ll find a submerged isthmus connecting Ponza and Zannone, sunken World War II ships, colourful marine life and amazing grottoes. There are frequent, high-speed crossings from Napoli, Terracina and the island of Ischia to Ponza and Ventotene. 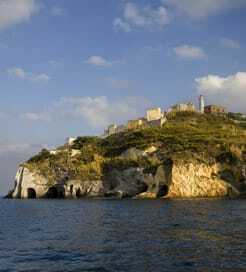 You can also sail between Ponza and Ventotene, with a number of crossings provided each week. For more information, please visit our Ferries from Italy to Pontine Islands page. For more information, please visit our Ferries from Gulf of Napoli to Pontine Islands page.